Get the latest TAE50216 Diploma of Training Design and Development learning resources from Australia’s leading learning resource developer! Your new TAE50216 Learning Resources will be delivered in unlocked digital format (Word, Excel files etc) so you can modify and contextualise the materials to your learner cohorts’ needs. You’ll have an unlimited student license so you can deliver and assess training to as many students as you want! 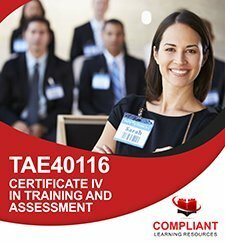 If you are looking for the full TAE50216 Diploma of Training Design and Development package including Assessment Tools, check the complete package page here. Your new Diploma of Training Design and Development learning resources from Compliant Learning Resources have been designed so you can deliver critically needed, high-quality Training Design Development training to your students. In this RTO training package, you will receive learner guide training resources for the Diploma Training Design Development qualification. These TAE50216 learner guide resources have been designed for use in Australian Registered Training Organisations. Order these RTO training resources now and help your students gain valuable skills to find work and develop their career in the Training Design Development industry! Our vocational training resources follow Australian VET industry best practice and our assessment tools are mapped to all unit criteria, giving you peace of mind to deliver your course with quality RTO materials and learning resources. This TAE50216 learner guide package has been written in a clustered format. Help your learners gain the latest industry knowledge with this premium training resource! Your Learner Guides package act as a textbook and provides you with the course information and learning content for your students to study in order to complete assessment tasks and gain their qualification. These learning resources match the Assessment Tools packages available in our shop, and you have the option to purchase the matching Assessment Tools separately in the future when you are ready. The complete learning resource package, including Learner Guide and Assessment Tool materials, is also available in a discounted package. You also have the option to develop your own assessment tools to match these learning materials or utilize a third party assessment resource of your choice. This package includes RTO resources for 10 units of competency. For more information about the Dip of Training Design and Development qualification, check the training.gov.au page here – TAE50216 Diploma of Training Design and Development. This qualification is written in a clustered format, so multiple units of competency are combined into each workbook. Clustering can significantly reduce the workload required to complete this course by reducing the duplication of learning and assessment tasks. This means your students can potentially progress faster and complete the qualification sooner, reduce the assessment workload on your trainers, and overall save you money on delivery and assessment while still achieving the required learning outcomes. You will get 1 simulated business account that will work for all your students. Access to the simulated workplace is included in your license fee and no ongoing fees apply. These RTO training materials are provided with an unlimited student license, so you can deliver and assess vocational training to as many students as you want with these learning resources. Your Diploma Training Design Development RTO materials will be delivered in “soft copy” digital format, so you can easily upload them to your Learning Management System, and distribute to your students digitally. You also have the option to print hard copy versions of the training resources for your students. This is learning resource was written and is maintained by Compliant Learning Resources. Licensing and support for these materials will be provided by Compliant Learning Resources. 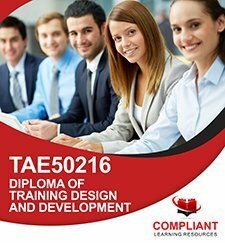 TAE50216 Diploma of Training Design and Development Learning Resources Package Includes 10 Units of Competency! 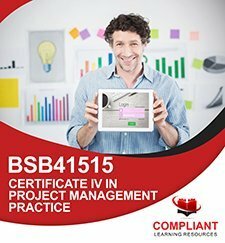 As part of this Diploma of Training Design and Development Learning and Assessment Resource package, you will receive learner guides for a full 10 units of competency. We have carefully pre-selected electives to deliver learning outcomes useful in a wide range of Training and Assessment settings. Resources developed by Compliant Learning Resources are provided for a “One-Off” License Fee with Unlimited Students – meaning you pay one upfront fee and there are no ongoing per-student or annual license fees. These assessment materials are designed from the ground up for compliance and have gone through our validation and review process. However, we do understand that each auditor interprets the standards a little differently, and you need to demonstrate compliance to your auditor. If for some reason your auditor isn’t satisfied with the assessment tool and believes rectifications are required, simply contact us and give us an opportunity to discuss with the auditor. If the auditor still isn’t satisfied, provide us with a copy of the official audit report as it relates to this training resource. We’ll be happy to complete the recommended rectifications required to comply with the auditor’s feedback within 21 business days.